Although many initially associate Rwanda with the horrific genocide that occurred there in the 1990’s, the country has become a stronghold of stability in the region, as well as a growing tourism destination. 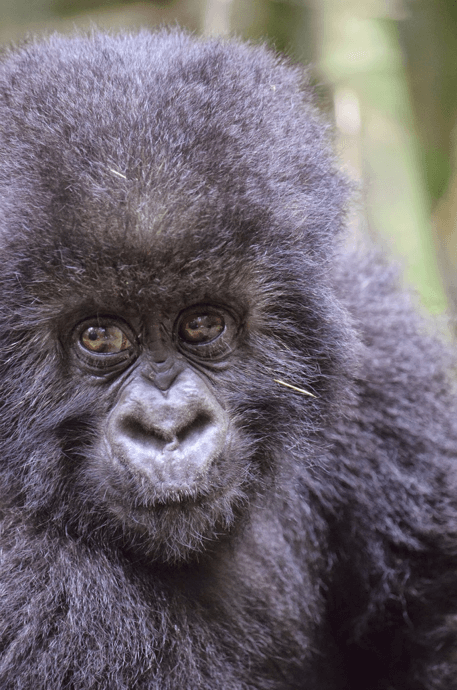 Rwanda is a wildlife lover’s dream come true; visitors can track wild mountain gorillas living in Volcanoes National Park and hike the Nyungwe Forest to search for chimpanzees. Tourists can also pay tribute to the past at impressive museums like Kigali Memorial Centre and the National Museum of Rwanda. Rwandans are rightly proud of their nation and eager to show visitors how far the country has come in the past twenty years. 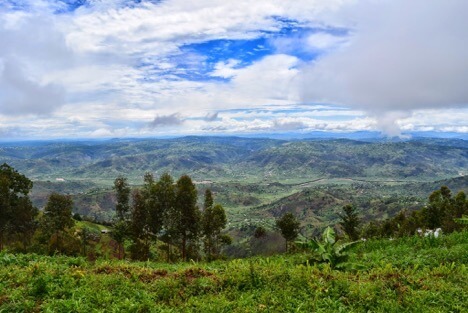 Although Rwanda is close to the equator, it’s known as the Land of a Thousand Hills for good reason: many of the places you’ll visit are at elevation. Click here to view the chart in millimeters. While you should be prepared for frequent rains and humid weather, mornings and evenings can be cold. 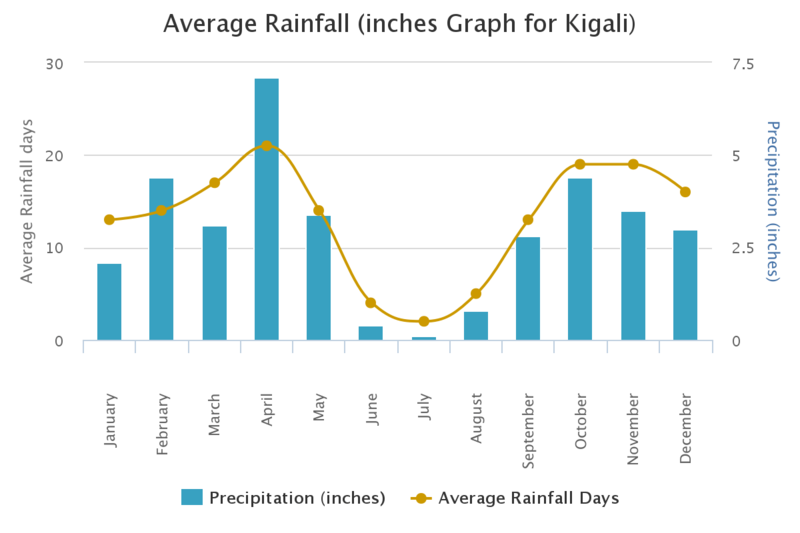 Mid-March to June is Rwanda’s heavy rainy season. 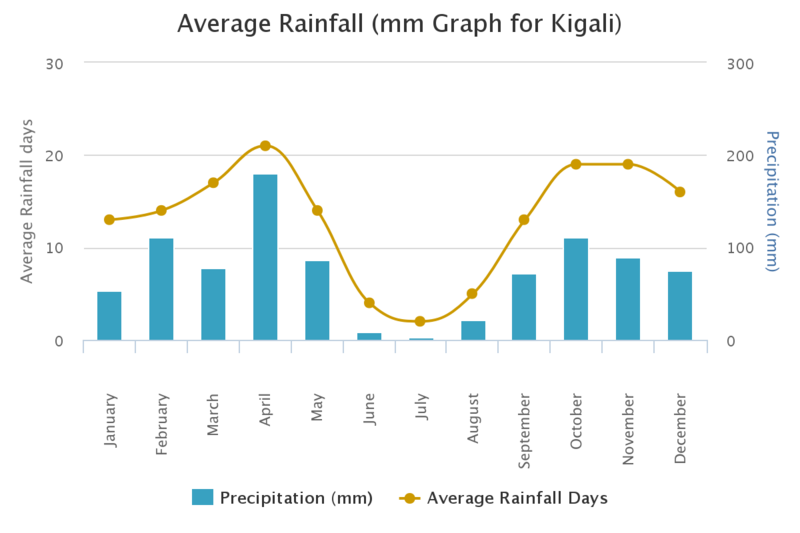 There is a long dry season from June to September and a brief rainy season between mid-September through December. I visited in early November, and it rained briefly several times every day with long stretches of sunshine in between. Click here to view the chart in Celsius. 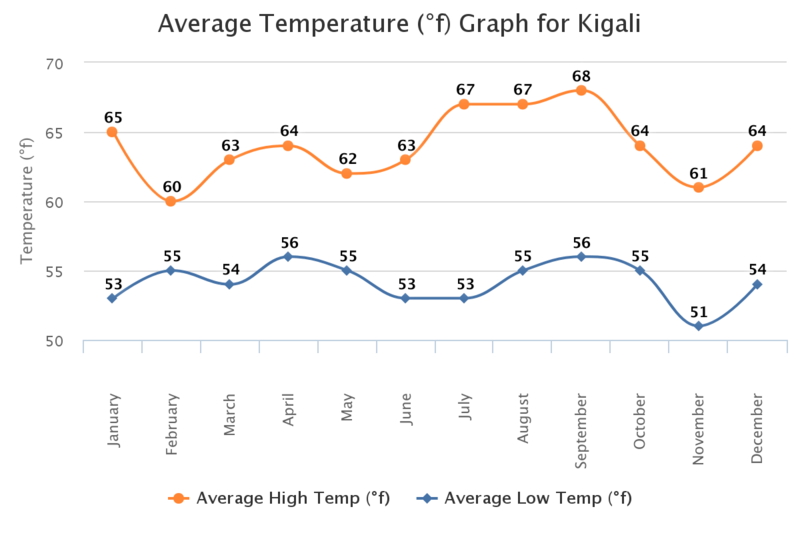 Temperatures in Kigali, Ruhengeri, and Volcanoes National Park ranged from 75F and humid to 50F overnight. I strongly recommend bringing rain gear no matter when you visit, as there are often brief showers even in the dry season. 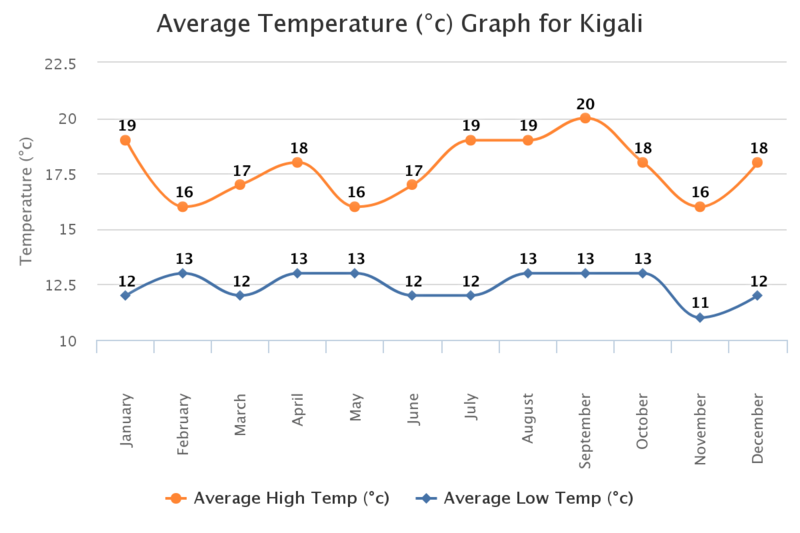 Despite the mountainous terrain, visitors to Rwanda do not usually need to worry about elevation sickness unless planning on climbing Mount Karisimbi, which tops 14,000 feet. The gorillas in Volcanoes National Park are almost never found above 8,500 feet. You would do well to travel as lightly as possible in Rwanda. 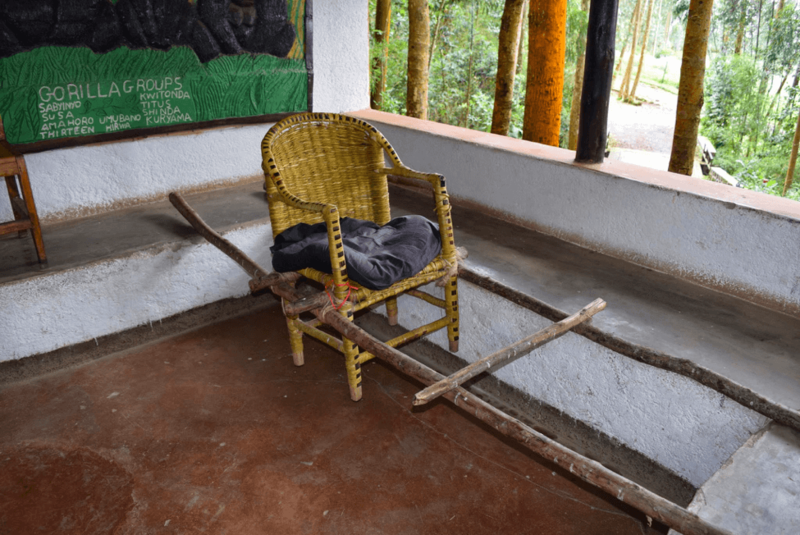 Many accommodations outside the capital city of Kigali have dirt or garden-type paths, do not offer elevator access, or require a long walk to access rooms. It’s easiest to travel with either a travel backpack or a carry-on size luggage that you’re comfortable carrying. Getting up to one of my accommodations required a 10 minute uphill walk, and it paid off to have light luggage! This is Rwanda’s “elevator alternative” for those with limited mobility. Chaos Ready Kenai Waterproof Backpack – You’ll need an additional small backpack to carry your water bottle, energy bars, moleskin, insect repellent, and camera equipment while trekking. If you have a waterproof case for your camera, a standard small backpack will work fine. 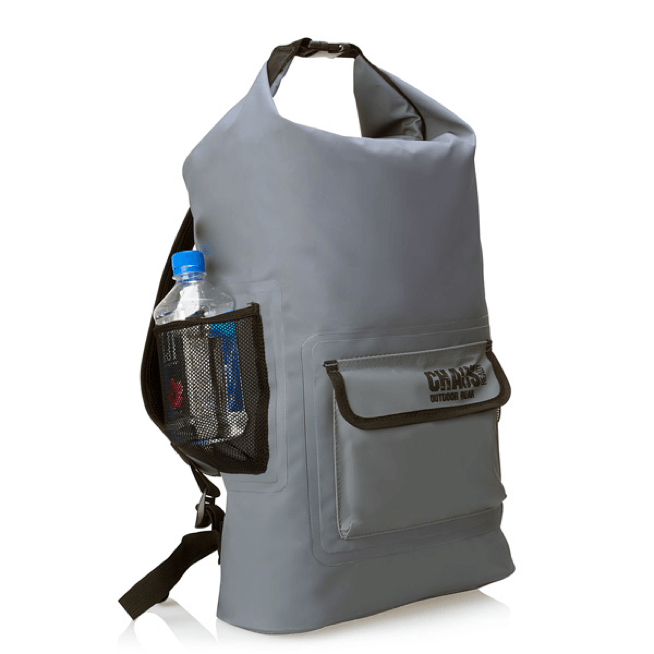 I like the Kenai because of its versatility and the side pocket allowing for easy water bottle access while hiking. Photo courtesy of Chaos Ready. I also brought a small foldable, zip-top purse to use in Kigali, only because I feel more comfortable and less like an “obvious tourist” when traveling with a purse. Flight 001 F1 Go Clean Laundry Bag – Clothing worn on treks will get filthy, and it’s nice to have a bag to separate your dirty laundry. I used a priced-to-move garbage bag brought from home, but the Flight 001 F1 Go Clean Laundry Bag is more sophisticated and helps to manage odors. Flight 001 F1 Go Clean Boot Bags are heavyweight nylon that work perfectly to separate your dirty hiking shoes from the rest of your luggage. Lightweight, breathable, quick-drying clothing is critical when planning a jungle trek. Keep in mind that many trekking operators include laundry service in their overnight rate, so you can pack lighter than you might otherwise do. 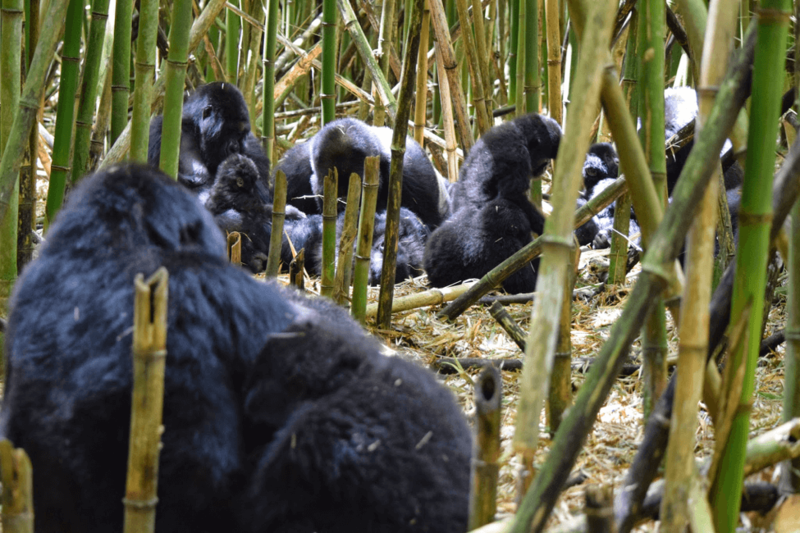 Here is a list of what I brought to Rwanda on a visit focusing on jungle trekking to see wildlife and which also included a few days in the capital city of Kigali. 1 Rain Jacket with effective ventilation. 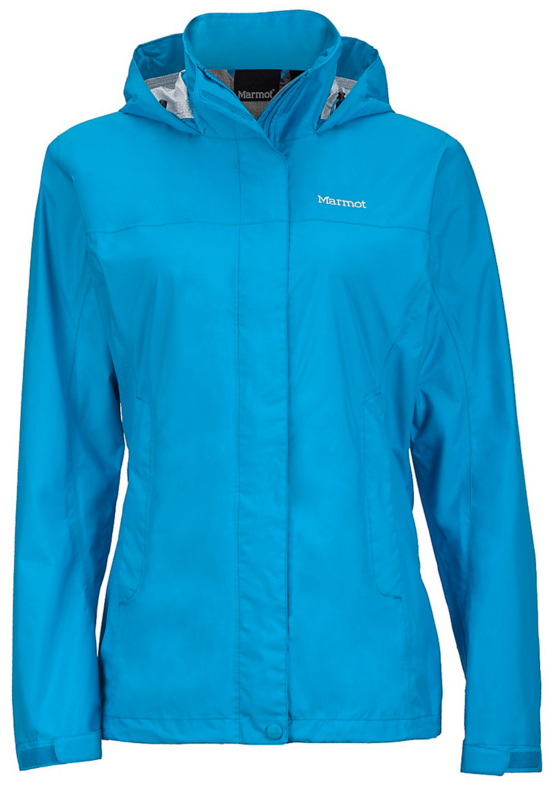 I wore my Marmot PreCip Jacket every day while visiting Rwanda and appreciated the zippers under the armpits for enhanced ventilation. The NanoPro technology also encourages breathability despite being waterproof. The hood allowed me to forgo a hat and worked perfectly to keep insects from slipping down my back while hiking through dense jungle. 2 Pairs of Full-Length Pants. You’ll have one pair to wear while laundering the other. Due to thorny brush and insects, you won’t want to wear shorts while trekking through the jungle, no matter how hot it is. I like to wear athletic pants when trekking, which are designed to wick away moisture, dry quickly, and allow me to move easily. I wore pants very similar to Lululemon Jet Crop Slim pants. They’re durable athletic pants that easily transition to city wear without looking like obvious “hiking” clothing. You might also bring one pair of more technical pants (Kuhl brand is one of my favorites). I’d recommend against traditional khaki “safari” colors, as the trails are muddy, and you will get filthy. Jeans aren’t a great option during the rainy season, but they’ll work during the dry season to protect you from stinging nettles on the trails. For male readers, my husband swears by his REI Adventures Pants; he found them comfortable, cool, and durable on our trekking days, and he wore them to nice dinners out in Kigali. 1 Pair of Gaiters to keep biting ants out of your pants and socks. The Outdoor Research Rocky Mountain Low Gaiters are a great investment if you plan on doing any serious trekking, especially in Southeast Asia or tropical South America. If you don’t foresee yourself using them again, simply tuck your pants into long wool socks to keep the ants out. I’d recommend doing this under your gaiters anyway. 1 Skirt, cut below the knee for women who don’t mind wearing skirts. Rwanda is a very conservative country, and local women do not wear pants (and especially not shorts) outside of Kigali. Our driver was really impressed that I wore a skirt “like the Rwandans” and told me I was the first foreign visitor he’d seen conform to local customs in that way. Pants are obviously essential for trekking, but if you’re visiting a town, a long skirt or dress will endear you to the locals. I brought a polyester blend midi-length dark skirt that resisted dirt and wrinkles well. I didn’t feel the need to dress up beyond my long skirt and waterproof sandals, even for dinner out in Kigali. Skirts are also much easier for using squat toilets, which you will likely encounter in smaller villages. Note that tank tops are acceptable, but make sure they’re not overly revealing or low-cut. 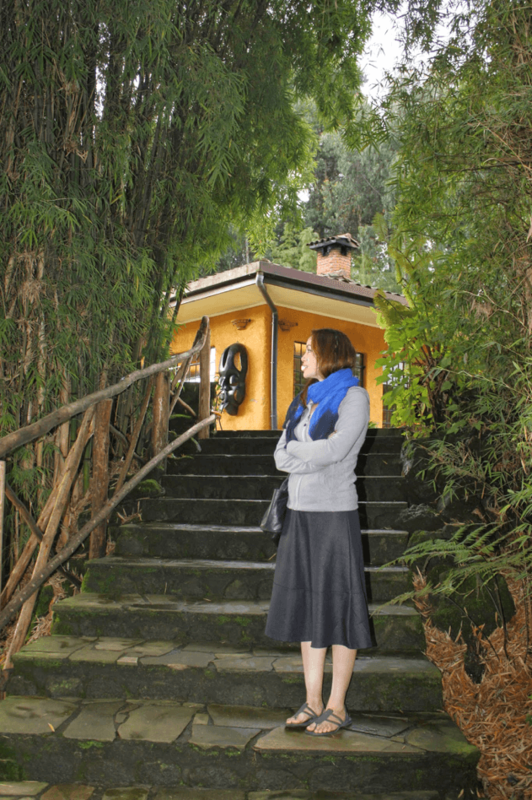 My standard “city/village wear” in Rwanda: below-the-knee skirt, waterproof sandals, fleece jacket layered over athletic shirt, and scarf. 1 Pair of Long Shorts (optional) for relaxing at your hotel. Note that local men typically only wear shorts while playing sports, so long pants are best for blending in. You could also choose to bring one pair of convertible pants. 2 Long-Sleeve, Lightweight Trekking Shirts. My husband is all about the Kuhl Clothing Wunderer Long-Sleeve Shirt, which also offers UV protection and sleeves that roll up to convert to a short sleeve. I like bringing one technical trekking shirt and one cotton long sleeve that can double as a pajama top. 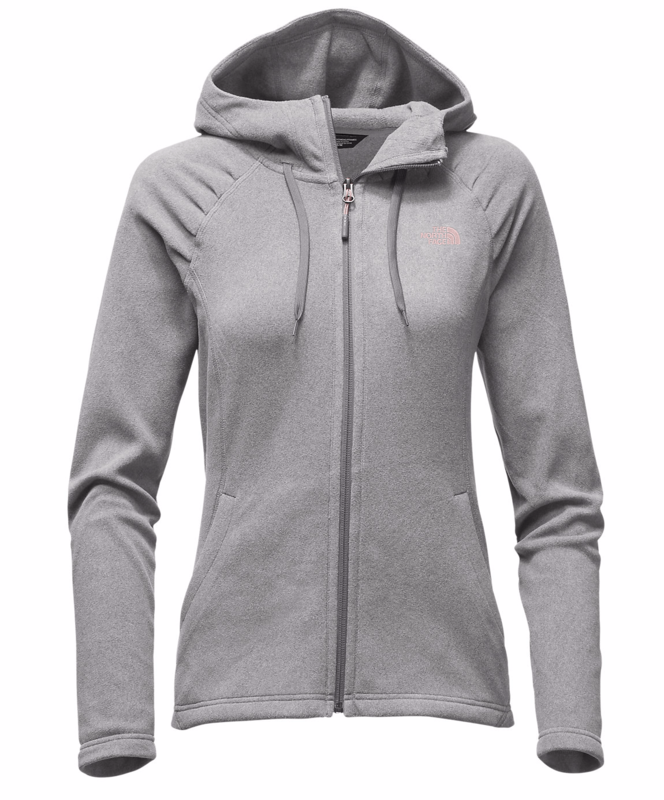 I found the Lululemon Yogi Everyday Long Sleeve perfect for transitioning from a light hike to dinner to bedtime. 3 T-Shirts that can be layered under rain gear. Again, I prefer shirts designed for athletic wear, as they’re great for wicking away sweat and moisture and extremely easy to launder on the go. Old Navy makes inexpensive, modestly-fitting short-sleeve shirts, which are important in a conservative country like Rwanda. 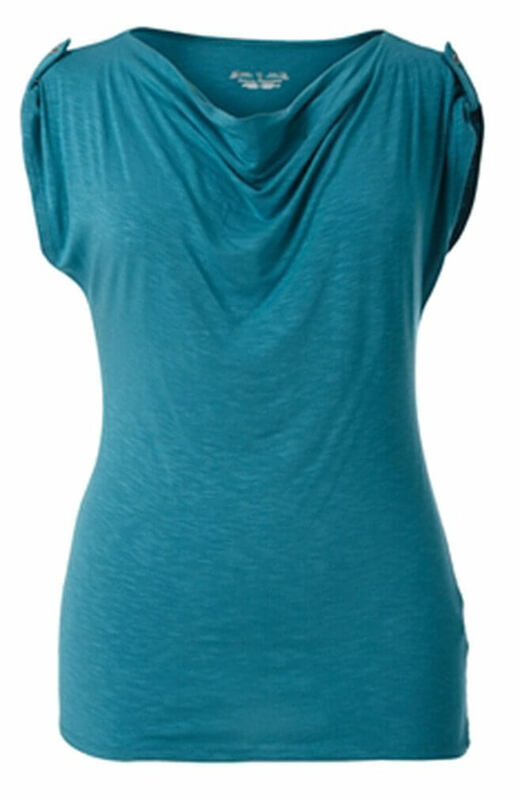 The Royal Robbins Noe Shirt pulls double-duty as a nice blouse when you’re in the city and has button tabs that allow you to convert the cap sleeves to a tank top when it gets muggy. 4 Pairs of Undergarments. There’s no need to bring too many undergarments, as you’ll need to be doing laundry frequently after trekking anyway. The hiking was fairly vigorous, and I found it helpful to bring 1 athletic sports bra. 1 Fleece Jacket for cool mornings and evenings. You’ll be at elevation near Volcanoes National Park, and it will get chilly at night. The North Face Mezzaluna Hoodie was super-warm worn over one of my long-sleeve shirts in the evenings and thin enough to be layered comfortably under my rain gear. 1 Pair of Long Pajama Bottoms and 1 Pair of Warm Socks for sleeping (again, it gets chilly overnight). 1 Large Scarf. My must-bring on every trip! 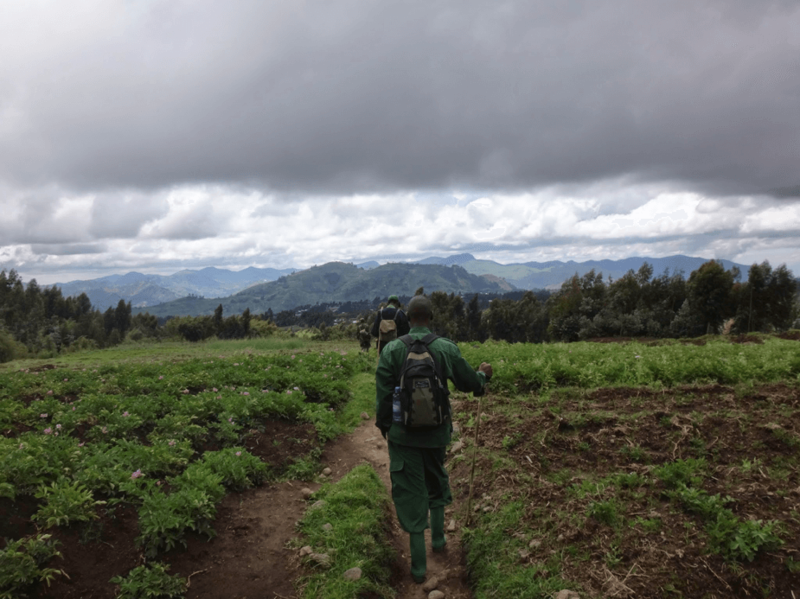 In Rwanda, it kept me warm in constantly variable temperatures, served as a blanket on the plane, and could work as a privacy screen should nature call while you’re trekking! 1 Pair Lightweight Gloves to protect from stinging nettles while hiking. Garden gloves should work fine. 1 pair of Lightweight Hiking Boots or Trail-Running Sneakers. 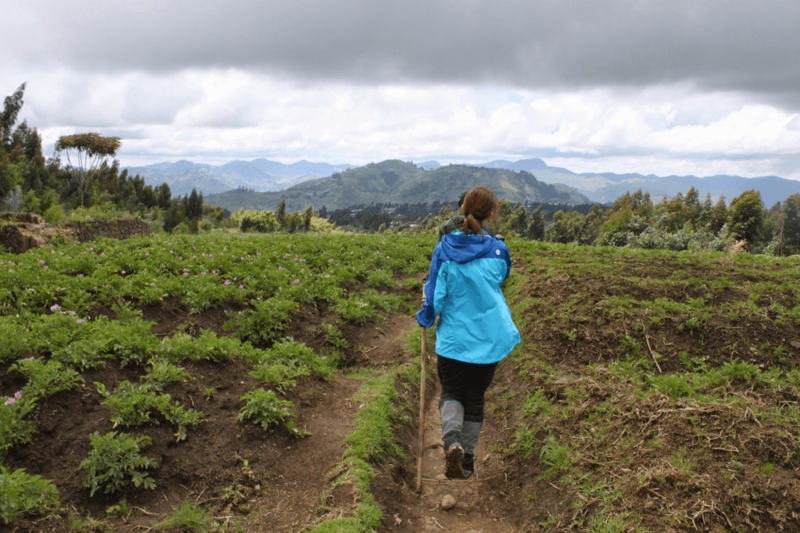 The hiking in Volcanoes National Park was fairly vigorous and included a number of different terrains: mud, steep slopes, bamboo forest, and volcanic rock. 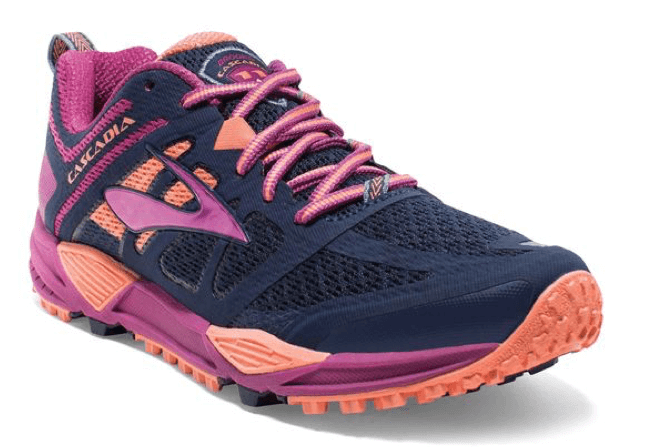 I wore my Brooks Cascadia Trail-Running Shoes and loved that they were ultra-light, provided great traction, and cleaned and dried easily for use the following day. If you require more ankle support, don’t hesitate to go for a more traditional hiking boot. Wear this pair of shoes on the plane to save space in your pack. Many of the local guides wear Wellington-type rubber boots, but I would’ve had a very hard time navigating the terrain in those. Before visiting Rwanda, I thought hiking boots might be a necessity for gorilla tracking. Happily, these Brooks trail-runners did the job perfectly. 1 Pair of Waterproof Sandals, for relaxing and for wearing while drying out your hiking shoes. I rave about my Crocs sandals to anyone who’ll listen. They’ve got great traction in rainy conditions, stay securely on my feet to double as water shoes, and have more style than I traditionally associate with Crocs. The exact brand I wear is no longer made, but I’m making a beeline for the Crocs Isabella Sandal when this pair eventually wears out. 4 Pairs of Socks. I brought two pairs of long wool socks for trekking and two pairs of merino-and-nylon running socks for shorter hikes. I warn against wearing cotton socks while hiking due to wet conditions and increased risk of blisters. The trekking outfit that worked best for me was my rain jacket layered over an athletic t-shirt (layers are essential, as it can get warm hiking up mountains), with athletic pants tucked into wool socks, trail-running sneakers, and gaiters. I gave up on the hiking stick pretty early on! While larger cities carry most basic toiletries, plan to bring all you need, as you’ll be based further afield while tracking gorillas. Contact lens solution, good hair conditioner, feminine hygiene items, and stick deodorant are all difficult to find anywhere in Rwanda. Anti-malarial medications. Keep in mind that most anti-malarial medications need to be started 1-2 days prior to entering affected areas and continued 7 days after leaving the area. Insect repellent with DEET. Mosquitos and malaria can be found everywhere in Rwanda. Feminine hygiene items! So important it’s worth repeating. Even in the capital city of Kigali, most stores do not carry feminine hygiene items. Packet of Tissue. Nearly everywhere we stopped had toilet paper, but you’ll want this when nature calls and you’re out trekking. Also bring a Ziploc plastic bag to carry out the aforementioned tissue- leave behind nothing but footprints! Hair Ties to pull your hair back on hot and humid hikes. Motion Sickness Medication like Dramamine, if you’re prone to motion sickness. Some of the roads outside Kigali can be bumpy and windy. Wifi is very slow throughout the country. Don’t expect to be able to upload photos while in Rwanda, so bring plenty of storage to back up your images. While Rwanda felt extremely safe, it is also a developing country, and many Rwandans live in poverty. Be cognizant about using electronics like iPhones and iPads out and about. I felt safe using my large DSLR camera, but I stored it in my purse while walking around (rather than wearing or holding it) in order to avoid being a target. Voltage Converter (possibly), as Rwanda’s voltage is 230V and standard US voltage is 120V. Check the electronics you’ll be bringing, though; most will list the range of voltages they accept, and most camera and laptop chargers come with a built-in voltage converter. I shot with a Nikon D5300 and used a 70-200mm f/2.8L lens. Operation was quiet enough not to disturb the gorillas, the f/2.8 aperture did well in low-light conditions, and it wasn’t too bulky a zoom lens to lug around. I would recommend sticking to one lens. You’ll have a maximum of one hour to spend with the gorillas, and I promise you won’t want to waste a single second fuddling with your lenses. Lighting conditions can be extremely variable, but I felt the f/2.8L served me well. Bring your lens hood to protect your equipment in wet conditions. Tripods aren’t permitted near the gorillas. I also stashed a waterproof point-and-shoot (a Sony DSC-TX30) in my pocket for quick operation while hiking. Waterproof Camera Case (or a plastic bag, if you’re like me). In all fairness, I should have sprung for a waterproof case and would do so if I were headed back to Rwanda in the rainy season. I got lucky in that it did not rain during our hour with the gorillas, but it would’ve been cumbersome and noisy to deal with a plastic bag “waterproof case” if I’d been caught in a downpour. Flashlight or Headlamp. Power outages can be common, and there’s little outdoor light outside city centers. Tablet or laptop to use when the wifi actually cooperates, to connect with others back home. Hard Drive to back up your amazing images. Binoculars are only worth the space if you’ll be birding. 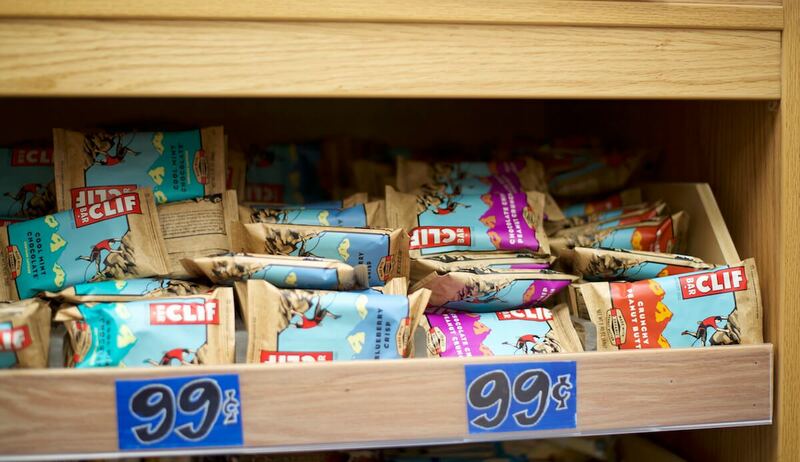 Energy bars to take trekking. I found vegetarian options everywhere we went; vegans might want to bring extra energy bars, just in case. Travel clothesline to dry out your clothing after laundering. Money. Everywhere I went in Rwanda, vendors were more than happy to do business in US dollars. Make sure to collect crisp bills dated 2006 or newer from your bank back in the U.S., as many places will give you a worse exchange rate (or not accept) older bills. Credit cards are generally only accepted in Kigali and at luxury hotels outside the city center. Bring enough cash to tip the guides, porters, and security personnel on your trek! Our group of two tourists had six guides traveling with us, some of whom had been poachers years earlier; I tried to tip very well in order to encourage responsible ecotourism as a responsible and lucrative alternative to poaching. Our team of extremely helpful porters, guides, and security personnel were fantastic. Water bottle. This is essential for staying hydrated while trekking. Dry bag, if you’re not planning on bringing a waterproof backpack. Travel-sized umbrella (optional). I skipped this and relied on my excellent rain gear to keep me dry. Walking Stick or Trekking Poles (optional). I am hideously uncoordinated and find it easier to just use my hands when traversing difficult terrain (this is where the lightweight gloves came in handy! ), but if you’re used to trekking with a walking stick, bring one that can be telescoped down to fit in your carry-on. Animal and bird guide books (optional). These can also be downloaded onto your ereader, so you can refer to pictures when you return from trekking. If you’re traveling with an outfit that can give back to locals and have extra space in your pack, these items are most appreciated in Rwanda: English dictionaries, soccer balls, and children’s backpacks. Enjoy your trip to Rwanda! Miranda Santiago is a travel writer and wildlife veterinarian. She has explored 58 countries across 6 continents- including a 17-country Round the World trip. Her travel photography was awarded Photo of the Year by BlogHer in 2014. Miranda now serves on the judging committee for SheKnows Media’s annual Voices of the Year blog competition. She also manages a bespoke travel consultancy (Spend Your Days) specializing in off-the-beaten-path destinations. Follow her on Instagram, Twitter, Facebook, and also her blog, Spend Your Days.